Your Macon, GA dentist offers fillings that protect teeth and offer aesthetic benefits, as well. If you’ve ever dealt with tooth decay, then chances are good that Dr. Clinton Watson and Dr. Nichole Jackson, your Macon, GA dentists at Northside Family Dentistry, placed a dental filling in your tooth. There are a variety of different kinds of fillings out there, and each one offers its own unique benefit for your smile. Composite resins have become a very popular dental filling as they offer both strength and aesthetics. Dental fillings are used to restore the decayed parts of a tooth. Getting a dental filling is usually the last step after your Macon dentist has removed the decaying portions of enamel and cleaned out the cavity. The filling material is then used to replace the cavity and help restore the shape of your tooth. It’s important that bacteria and decay aren’t able to break through tooth enamel. To prevent this from happening to your tooth again, Dr, Watson or Dr. Jackson will fill your tooth, which repairs and it seals out any further decay. What are the different kinds of dental fillings? 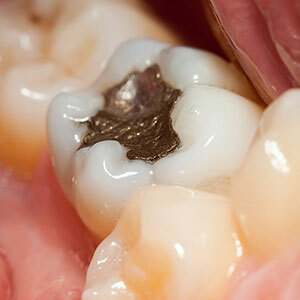 There are several different kinds of dental fillings: gold, silver, composite and porcelain. While gold and silver fillings boast a long lifespan because of their strength and resilience, composite resin fillings have become the most popular dental filling because they actually match the color of your tooth. How do you get a dental filling? The patient is usually given local anesthesia before your Macon dentist drills away the decayed parts of enamel from your tooth. Once this is complete, they will begin to apply the composite filling in layers. After molding each layer, a laser is used to harden it before applying a new layer of resin. Your dentist will continue to mold and harden the resin until they have completely restored the damaged parts of your tooth. A surefire way to make sure you’re not dealing with tooth decay is to see your Macon, GA dentist every six months for routine exams. If it’s time for you bi-annual cleaning, then it’s time to schedule an appointment with Dr. Clinton Watson and Dr. Nichole Jackson at Northside Family Dentistry.